Severe storms producing powerful tornadoes ripped through the town of Canton, Texas, on Saturday and a local Fiat-Chrysler dealer took the full brunt of the twister. The devastation to vehicles and property is frightening, but luckily all of the employees made it out safely. According to local news affiliate NBC DFW-Channel 5, Interstate 20 Chrysler Dodge Jeep Ram suffered massive destruction when a large tornado tore through buildings and tossed cars and trucks around. Several vehicles were found either upside down or on their side. Dealership owner Randall Noe told reporters that none of his employees were on the scene when the tornado hit. 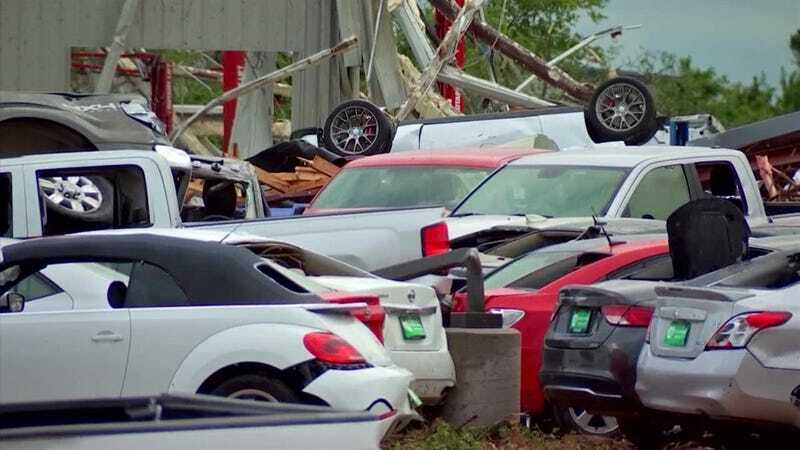 Even though the dealership only suffered property damage, Canton Mayor Lou Ann Everett confirmed Sunday evening that four people were killed in the storm. The National Weather Service issued a statement saying that at least four tornadoes touched down in the surrounding counties and two of those twisters produced wind speeds exceeding 140 mph.